Winner of the 2016 Richard F. Fenno, Jr. Prize for the best book in legislative studies and co-winner of the 2016 Leon Epstein Prize for an outstanding contribution to research and scholarship on political organizations and parties. Read the Cambridge Blog about the book! 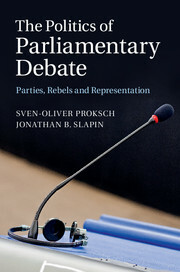 ​Book reviewed in Party Politics, Perspectives on Politics, Journal of Politics, West European Politics, Political Studies Review. Parliamentary debate is a fundamental aspect of democratic law-making. While law makers everywhere seek to express their views in parliament, there are large discrepancies in who has access to the floor across political systems. This book explains how parties and their members of parliament (MPs) structure parliamentary debate. Parties may actively seek to prevent some members from taking the floor while promoting opportunities for others. In doing so, they attempt to control the message that their partisans convey in parliament, to present a unified message to the public. The authors provide a theoretical model to explain the design of procedural rules in parliament, how the party leadership interacts with rebel backbenchers, and how MPs represent voters. The book explores political institutions, intra-party politics, electoral politics and legislative behaviour in developing and testing a new theory of parliamentary debate, using data from the UK, Germany, New Zealand and the European Parliament.